Tiger grass (Thysanolaena maxima), locally known as ‘tambo’ in Tagalog, has great ecological and economic importance. As hedgerow, the species helps control soil erosion while helping conserve water. 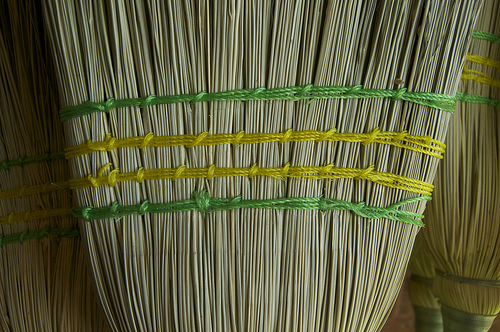 As raw material for soft broom production, it provides potential livelihood to upland farmers due to increasing demand for tiger grass-made brooms. Tiger grass is being propagated by upland farmers in some parts of Benguet Province. Likewise, it grows abundantly in the highland areas of Ifugao and Mt. Province. It can be grown in many types of soils such as clay, sandy clay loam and sandy loam. A one and one-half year old Tiger grass starts producing panicles in good sites. Panicle is the branching inflorescence in which small flowers are borne along an elongated axis. The panicles usually develop from October to March every year. There are two known methods of propagating Tiger grass namely, by seeds and by rootstocks. However, propagating by seeds is rarely done because spacing between plants can not be regulated and will take a long time for the plant to mature and produce panicles. Because of this, propagating Tiger grass by rootstock is commonly used. Clumps of mature Tiger grass are uprooted, and the upper portion of the grass is cut. About 12-15 cm of the culm measured from the rootstock is left and can be divided into 3 culm individual rootstock. * Planting sites should be prepared by completely removing the grass and other undesirable vegetation; strip clearing or spot-ring clearing methods may be employed; and planting holes of about 30-50 cm in diameter shall be prepared for the rootstocks. As mentioned earlier, Tiger grass can be propagated by seeds or by rootstocks. But for rootstocks, they are planted in prepared planting holes. Planting holes of about 30-50 cm in diameter are prepared first before the rootstocks which are collected from the mother plants are finally planted. For best results, the rootstocks should be planted during the onset of the rainy season. The plants will produce more shoots and could yield more panicles. The ideal spacing requirements of Tiger grass when planted in pure plantation is 4 m x 4 m. If interplanted with other crops like fruit trees, the recommended spacing is 8 m x 8 m.
Tiger grass can thrive in many types of soil such as clay, sandy clay loam, and sandy loam. However, fertilization can be done in areas where soil nutrients are deficient to enhance growth and flower development of the plants. The appropriate fertilizer application is 20 grams of NPK (or complete fertilizer) per rootstock or plant. Fertilizer should be applied 10 cm away from the base of the plant and dug around to mix the fertilizer with the soil. 1. One year after planting, inventory of the mortality should be conducted so that replanting can be immediately done during the next rainy season. 2. To minimize competition of soil nutrients, space, light and moisture, weeding should be done during the rainy season when there is abundant growth of competing vegetation. 3. Fertilization may be done in areas deficient of soil nutrients to enhance growth and flower development following the rate mentioned earlier. 4. Plantations should be protected from a stray animals and wild fires. 1. Cut the panicles with a sharp sickle or bolo when they are still green and soft. This could ease the cleaning and removal of seeds. 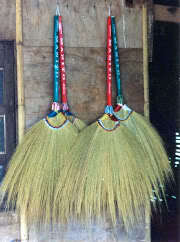 Mature ones are hard and rough, and could result to low quality brooms. 2. When the panicles have been harvested, cut about 90% of the aerial part of the plant so that more tillers/shoots will develop during the next rainy season. 3. Harvested panicles must be dried under direct sunlight for about 2-3 days. 4. During and after the drying period, the seeds must be removed by shaking or patting them lightly against a big stone or a concrete pavement. 5. After drying and cleaning, panicles must be bundled into an average size of about 7 cm in diameter per bundle. Each bundle consists of an average of 210 panicles. 6. Bundled panicles are then ready for softbroom-making and marketing. The panicles are then sold and delivered to softbroom manufacturers. Panicles usually develop from October to March. The best time therefore to harvest the panicles is during the months of February and March. Make sure that the panicles reaches the desired length, softness and greenness to produce quality softbrooms. The age of the panicles to be harvested is 5 months. Tip: After the last harvest, cut all the remaining vegetative parts down to 30 cm for regeneration. New tillers will develop and the cut portion can be used as good fodder for goat, cattle and other farm animals like the carabao. 1. Use a bundle consisting of 105 panicles (number of panicles may vary depending on the desired thickness of the broom) to make one broom. 2. Sort the panicles according to length. 3. Shear some of its first spikelets (flowers) and ensure that an average remaining length is maintained. 4. Tie these sheared spikelets to the main stem to all thickness to the broom. 5. Maintain some of the stalks to serve as handle. 6. Arrange the added spikelets (tightly bound with string) into five to six small bundles (1-1.5 cm diameter) and bind together to make one big bundle. 7. Tightly bind together the stalks using tie wire to form the handle. 8. Use wood or bamboo stick as handle. Bind together with the panicles. 9. Arrange the panicles into fan-like form with plastic string or split rattan. 10. Decorate the handle or wrap with rolled plastic or split rattan to indicate the origin of the product. Undergraduate thesis (Jennifer Salayon), AgEn Department, DMMMSU, NLUC, Bacnotan, La Union. Engine driven with semi-automated feeding. do you have any local machine to remove the pollen grains from tiger grass?